Swiss chard resembles beet greens in both flavor and appearance without the fuss of dealing with underground roots. For quick "greens," or a flavorful addition to green salads, add this vegetable to your list. Although traditional white-stemmed varieties produce better, I prefer to grow "bright lights," as these colorful plants brighten the garden with stems of red, yellow and gold. 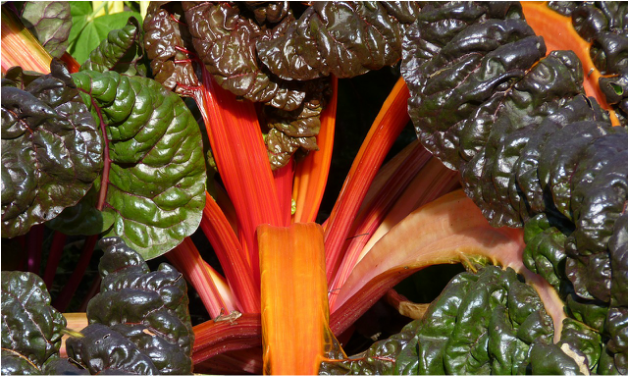 Choosing a Location: Select a location that receives six to eight hours of direct sunlight a day for Swiss chard. Avoid planting in low areas, as water often pools in low areas after rains and may not drain well. For best results, choose an area that is slightly raised in the center. Preparing the soil: Till the soil to a depth of 8 to 10 inches with a garden tiller or spade. Remove large rocks, roots or other debris to create loose soil. Amending the soil: Add a two to three inch layer of organic matter - such as compost or aged manure. Work the organic matter into the top six inches of the soil to improve texture, increase aeration and promote good drainage. Finish off with 5-10-10 or 10-10-10 fertilizer following the recommended application rate on the container. Work the fertilizer in well to avoid injury to seeds and young plants. Planting: Sow Swiss chard seeds directly in the ground approximately two weeks before the last expected frost in the spring. Plant the seeds to a depth of ¼ to ½ inch and cover with soil, firming down lightly to secure the seeds. Space seeds an inch or two apart, if you intend to eat the greens when they are young - otherwise space them 4 inches apart in rows. Keep the soil moist until seedlings emerge. Thinning: Thin Swiss chard to stand 4 to 8 inches apart when the seedlings are four inches high. These baby greens make the perfect addition to garden salads, as they are sweet and tender. Weeding: Keep weeds under control with organic mulch, such as grass clippings, or hand pick the weeds as soon as they appear. Many prefer to clip the weeds at the base to avoid disrupting the roots of Swiss chard - but remember, if the roots of weeds are left in the ground, they will return. I find it easiest to simply check the bed every day and pluck out any new weeds that appear. Watering: Water Swiss chard deeply once or twice a week or whenever the soil feels dry one inch below the surface. Those grown in raised beds or containers may require daily watering as the soil dries quickly in containers. Harvesting: Harvest Swiss chard at any time once the leaves are four to six inches in height by cutting the leaves to the ground level. New growth appears within a few days producing a second harvest within a week or two. Some prefer to harvest the outer leaves only allowing the tiny center leaves to continue to grow.